Sprite Industries, of Corona, Calif., now offers solid metal shower filters for upscale homes in its popular Slim-Line series. The all-brass cartridge chamber combines filtration performance with a choice of polished brass or polished chrome finish and a five-year limited warranty. 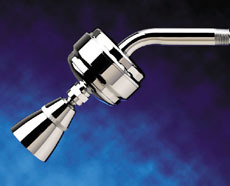 Made to complement all-metal bathroom faucets, the filters are available with matching solid brass adjustable showerheads. The company is the world leader in shower filtration technology with more than 20 U.S. and international patents.